Integrated power measurement technology is the fundamental design principle of the 2INpower Road Crankset to precisely record power individually in each leg. The power meter is extremely accurate thanks to placement of four strain gauges in the thru-axle and four in the crankarm. 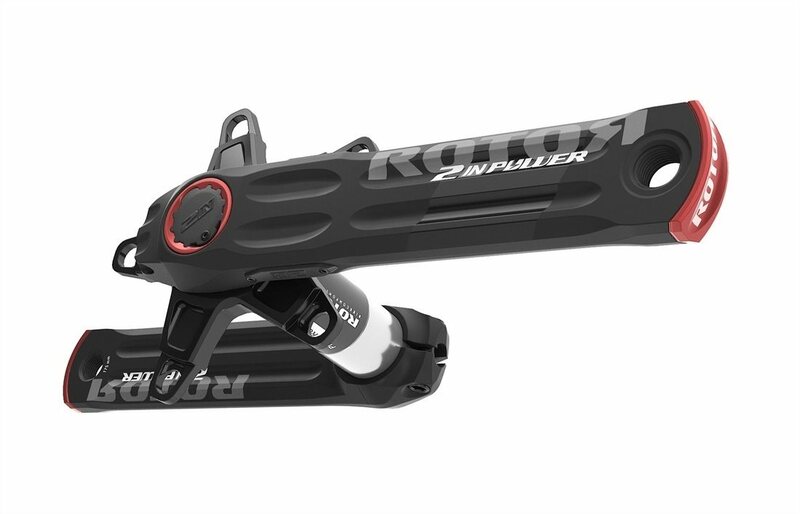 Rotor situates all the electronics in the spindle which provides additional protection from the elements and allows the crankset to maintain a traditional slim look. The metrics provided are claimed to be accurate within 1-1.5%. For example, the crankset measures cadence over 500 times per pedal stroke. The 2INpower sends out ANT+ and Bluetooth Smart signals simultaneously. These can be picked up by ANT+ head units, Bluetooth head units, smartphones, tablets, and cycling computers. In other words, it’s compatible with just about everything. The Bluetooth signal also allows you to utilize Rotor’s Torque 360 metrics to dial in your pedal stroke and you can use their OCA software to determine proper oval ring placement for optimal power transfer. The 2INpower crankset is compatible with round rings but using Rotor’s Q-rings take full advantage of the system’s potential. While you charge the battery via a magnetic connection at the end of the crank arm, Rotor provides seamless data upload by partnering with TrainingPeaks. The 2INpower Crankset can be used with Rotor’s Universal Bottom Bracket (UBB) concept, meaning it’s compatible with English threaded, Italian threaded, BB30, PF30 BBright, and BB386 bottom bracket standards. The crankset comes in 165, 170, 172.5, and 175mm lengths, the Q-Factor is 148mm, and the chain line is 43.5mm. Does it include/ need an adapter to fit with a BB86 bottom bracket? BEST ANSWER: I believe you will need to replace your bottom bracket with a Rotor press fit 4130. They go for like $30 or so. BEST ANSWER: This is a road crank...and it's awesome!